The root of Arnebia euchroma (Royle) Johnst., Lithospermum erythrorhizon Sieb. et Zucc or A. guttata Bunge of family Lithospermi. Xinjiang Zi Cao which is known as Ruan Zi Cao is mainly produced in Xinjiang, Gansu and Tibet in China, while Zi Cao known as Ying Zi Cao is mainly produced in northeast and northern China, and other provinces in the middle or downstream of the Yangtze River. Ruan Zi Cao is slight bitter and astringent. While Ying Zi Cao is sour and sweet. Pathy and long stem in violet, tiny wood, and soft are top quality for Ruan Zi Cao, and good Ying Zi Cao is marked by large, long, violet, hard and crisp, big in wood. Bitter, pungent, cold, heart and liver meridians entered. Clear heat and cool blood, purge fire, activate blood and resolve stasis, remove toxicity and promote eruption. 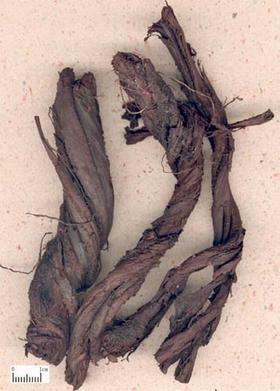 It can not only clear heat and cool blood, but also resolve blood stasis and remove toxicity, so it is commonly indicated for heat-toxicity accumulation in blood system of warm disease manifested as dark-purple macular eruption, and often combined with herbs of clearing heat and removing toxicity and herbs of cooling blood and curing macular for mutually reinforcement, such as Lian Qiao, Chi Shao, Chan Tui and Da Qing Ye. It is also used with blooding-cooling and bleeding-stopping herbs in treating the hemorrhage caused by blood heat by its heat-clearing and blood-cooling actions. It can cool blood, resolve stasis, remove toxicity and promote eruption as well. For macular in dark purple color without adequate eruption due to excessive heat-toxicity accumulation and stagnation of blood flow, it can be used singly in ways of either infusing with boiled water or decocting, and can also be combined with heat-clearing and eruption-promoting herbs, such as Jin Yin Hua and Niu Bang Zi, etc. In addition, it has a certain action of preventing measles. It can not only clear heat, remove toxicity and cool blood, but also resolve stasis and relieve swelling, and is commonly indicated for sores and abscess with swelling pain. It is often combined with toxicity-removing and abscess-curing herbs, such as Jin Yin Hua, Lian Qiao and Pu Gong Ying. For long-term sores and abscess with difficult healing wound, it is often combined with tissue-granulation-promoting and wound-healing herbs. For instance, it is used with Dang Gui, Bai Zhi, Xue Jie and so on in Sheng Ji Yu Hong Gao recorded in Wai Ke Zheng Zong. For eczema, it can be combined with heat-clearing and dampness-drying herbs, such as Huang Lian. Huang Bai and Lou Lu in Zi Cao Gao from the book Ren Zhai Zhi Zhi Fang Lun. For burn due to hot liquid or fire, it can be soaked in vegetable oil and then filtered and applied externally; or it can be combined with toxicity-removing and would-healing herbs, such as Huang Lian, Huang Bai and Di Yu, etc. Decoct 5~10g. Decocted plaster or soaked oil is used externally. It's contraindicated in cases of diarrhea due to spleen deficiency, for its defecation-promoting action.